I like this low cal, high protein dish. You can do any colored bell pepper, but I prefer red because it’s high in vitamin C and vitamin A (and it’s pretty). In a medium skillet, brown ground turkey with a little olive oil and add in tomatoes and mushrooms with spices. After the turkey is cooked through, scoop into bell pepper. 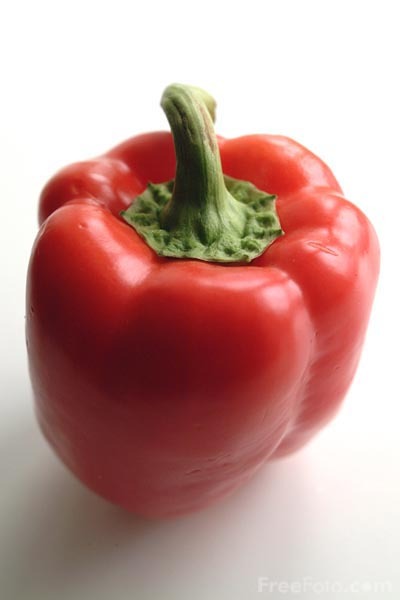 Place the bell pepper in a deep baking dish with about 3 inches of water depth. Bake in oven at 400 degrees for 30 minutes. I like a little low fat mozarella cheese sprinkled on top before putting it into the oven. I like this dish because it’s inexpensive to make, easy, and FULL of good protein, omega-3’s, and other nutrients. it’s really great for almost any meal. I like a little hot sauce or salsa on the side. Also, I didn’t have any on hand but a handful of spinach would probably be good in this too. In a bowl, mix all the ingredients well. In a medium-heated skillet, spray with olive oil and pour mix in. Turn down heat to low and cover for about 5 minutes. Uncover and cook on low heat until done. You might have to flip the frittata over to cook the top side well. I soon want to try oven-roasting butternut squash, parsnips, fennel, and radishes (currently in season!) Or, a great way to decide is just to buy whatever produce is in season/on sale. 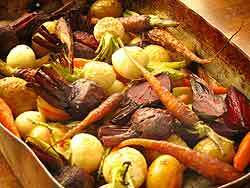 A hodgepodge of mixed vegetables with sliced onion would be delicious too. You could also mix a little balsamic vinegar after taking them out of the oven for more flavor. You can even oven-roast kale and make them into kale chips! (refer to http://www.foodista.com/recipe/S7MV2NFR/kale-chips) apparently, very addicting 🙂 plus MUCH more nutritious than your average potato chip. Using spices in simple dishes can really make a difference. Heat oil in saute pan, then brown chicken on each side (2-3 minutes). Toss in zucchini/squash, onions, and garlic. Once zucchini is lightly browned, add the rest of the ingredients and simmer for 10-15 minutes. You can serve this over brown rice or couscous, or plain. eggplant is one of my favorite vegetables. i could easily eat it cross-sectioned and baked with a little extra virgin olive oil. but if i want a really satisfying eggplant meal, i LOVE eggplant parmesan (but not all the calories that come with it). instead of using the traditional eggplant parmasan ingredients, this recipe is modified to accommodate my daily eating habits with some added protein. Cross-section slice the eggplant into 1/4″ thick slices and salt them to remove bitterness (refer to this link). Preheat oven to 375 degrees. Dip each side of eggplant slices into eggwhites and dip into almond meal to cover both sides. Place slices on baking tray and bake until sides are brown (about 10 minutes). Now, you could easily eat it like this and put some warm tomato or marinara sauce on top without any cheese, OR you could do layers in this order using an 8×8 baking dish: 1/4 cup sauce, some mozzarella, eggplant slices, 1/4 cup sauce, eggplant slices, 1/4 sauce, remaining cheese. Cover with foil and bake for 25 minutes or until heated. Larabars are by far my favorite energy/snack bar. they are the purest in ingredients in comparison to other energy bars. obviously, there is a huge difference in numbers and quality of the ingredients. most of the stuff in the Zone bar can be found in a chemistry lab… not to mention that it has corn syrup which has been proven to leave you even hungrier due to blocking leptin receptors, ultimately leading to weight gain (refer to: http://ajpregu.physiology.org/cgi/content/abstract/00195.2008v1). anyways, larabars comes in a variety of flavors, but can get kind of expensive with its healthy addiction. the good news is, its simple ingredients = simple homemaking!!! Your “add-ins” can be whatever additional flavoring you want. Coconut flakes, chopped pecans, chopped walnuts, dark chocolate bits, unsweetened cocoa, dried fruit, or baked fresh fruit (ie. banana slices) can be any of your options. The options are endless 🙂 Simply combine all the ingredients into a food processor until mixed. Take the “mush” and place between two sheets of wax paper and flatten it with a cutting board. You can refrigerate this for about 15-20 minutes to make it easier to cut into bar sizes. This should make about 6 bars. Wrap up each bar individually with saran wrap and refrigerate for storage. yum! i had NO idea that kale was edible (you know that garnish vegetable you normally get?) not only that, but it is a very nutrient-dense vegetable with over 1300% of your daily vitamin k requirement, 190% of vitamin A requirement, 88.8% of vitamin C, 25% of manganese, and so much more. in addition, it’s a very low-cal way to get all your nutrients. With a little olive oil, let the minced or chopped garlic heat up in a pan over medium heat and then add sesame seeds and rinsed chickpeas to brown a little for about 5 minutes. Simply add in kale with water, cover pan for at least 7 minutes or more to fully cook. Stir occasionally… kale takes longer to cook than other greens. Not only is this side dish packed from nutrients from the kale, but the chickpeas give it a good source of protein. This is a pretty simple-tasting dish, or more flavor I would suggest about 2-3 tbsp of rice vinegar with some soy sauce.